Post written by Young Koog Cheon, MD, PhD, from the Digestive Disease Center, Department of Internal Medicine, Konkuk University School of Medicine in South Korea. Endoscopic papillary balloon dilation (EPBD) using balloons with a diameter of less than 8mm is considered to preserve papillary function. However, it is still unknown whether papillary function is preserved after performing endoscopic papillary large balloon dilation (EPLBD, >12 mm in diameter) with or without endoscopic sphincterotomy. Large balloon dilation not only widely opens the ampullary orifice more than small balloon dilation or EST but also widens the distal bile duct and reduces the mechanical lithotripsy rate, which consequently reduces fluoroscopic time in comparison to treating CBD stones with EST only. It was thought that the loss of SO function would occur much the same as with EST due to the widening of the ampullary orifice; however, there are no objective studies regarding this matter. Figure 3. Between-group comparisons of the mean sphincter of Oddi (SO) basal pressure 1 week and 1 year after procedures. EPLBD, endoscopic papillary large-balloon dilation; EST, endoscopic sphincterotomy. It is still unknown whether papillary function is preserved after performing EPLBD. Endoscopic papillary large balloon dilation for difficult bile duct stone management does not preserve sphincter of Oddi function. EPLBD alone has similar efficacy and safety in comparison to EST with EPLBD for removal of large common bile duct (CBD) stones. 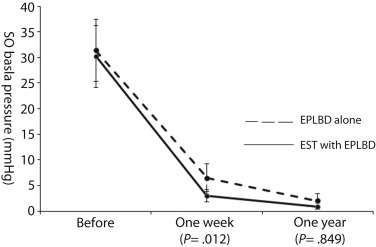 Compared with EPBD, EPLBD does not cause a high rate of pancreatitis. Long-term effects including a stone recurrence arising from the loss of biliary sphincter function after EPLBD should be evaluated for patients with dilated CBD. Since EPLBD itself does not require an expert, it is able to remove large CBD stones effectively without an endoscopist’s expertise.